[Episcopal News Service] Sarah Jacobs, 17, doesn’t feel safe. After the deadly mass shooting at a Florida school on Feb. 14, the senior at Fishers High School in a suburb of Indianapolis, Indiana, said no school is safe from gun violence anymore, and that’s not right. Jacob attends St. Christopher’s Episcopal Church in Carmel, and she’s on the Diocese of Indianapolis youth steering committee. Her committee decided during a Feb. 25 conference call to talk during its March 3-4 youth retreat about how they feel about what happened and what they can do about it, and share opportunities. She hopes to attend the national student-led March For Our Lives in Washington D.C. on March 24, while other teens join local marches on the same day nationwide. “We like to think it doesn’t affect our area, but it does. It’s not just ‘those’ people. It could happen to anyone, anywhere,” Jacobs told Episcopal News Service just after she got out of class. At Jacobs’ school and at others nationwide, teens are planning a walkout at 10 a.m. March 14, for 17 minutes, one minute for each person who died at the South Florida school. It’s been two weeks since 17 people — including 14 teenagers — were killed by a former student at Marjory Stoneman Douglas High School in Parkland, Florida, wielding his legally owned, military-style, AR-15 semi-automatic rifle. Since then, Episcopal teenagers and children are among the wave of youth across the United States sparked by the most recent shooting to protest, march and speak out for meaningful gun legislation. Nikolas Cruz, who is charged in the Parkland shooting, used the same kind of gun used in several other mass shootings, most notably at the 2012 shooting that killed 27 people at Sandy Hook Elementary School in Newtown, Connecticut. Diocese of Central Pennsylvania Bishop Audrey Scanlan will join a youth group to rally and march at the capitol in Harrisburg on March 24. Clergy is invited to attend, vested in cassocks, to be a clear, visible witness, she said. The diocesan website has resources on how to respond to gun violence, and its Facebook page will be updated with local events. There will be rallies also in York, Lancaster and possibly Williamsport, she said. More than 1,000 people expressed interest in the Harrisburg event and more than 4,000 for Lancaster. Although the Washington D.C. march is only a couple hours away, Scanlan wants to stay local. “The whole idea that this is being led by the students is just tremendous, and I want to support our youth in our schools where we live, which I think is more important,” she said. Whenever there’s a school shooting, Scanlan thinks of the 2006 shooting in West Nickel Mine, Pennsylvania, where a gunman shot 11 people in a one-room Amish school house, killing five girls. “We as adults have a responsibility to create and maintain a just and peaceful society, and we are failing. Our society is fractured, and gun violence is one of the symptoms. When our children rise up, I can do nothing less than follow them. They deserve my support,” Scanlan said. The Rev. 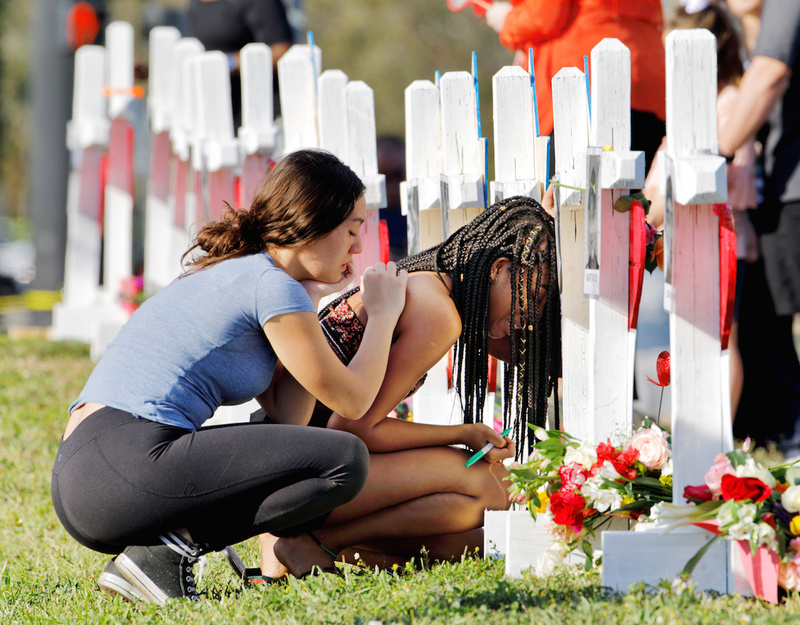 Mark Sims, rector of St. Mary Magdalene Episcopal Church in Coral Springs, Florida, asks people to respect the teens during this tough time and listen to what they have to say. One of the school shooting victims, Carmen Schentrup, a 16-year-old youth group leader, belonged to his parish. The student body at Saint Edward’s School in Vero Beach, Florida, is not making a public statement about student-led protests, said Monica Jennings, the Episcopal school’s spokeswoman. “There may be individual students who are interested in participating, but at this time, the school as a whole is not taking any specific action beyond internal communication with our faculty and families,” Jennings told ENS. The school constantly updates and re-evaluates security procedures on campus, a process that was already under way at the time of the Parkland tragedy, she said. Several Episcopal schools did not reply to ENS inquiries asking for comment, including Episcopal School of Jacksonville, Florida, whose head of school was shot in 2012 in a murder-suicide by a recently fired teacher. However, the National Association of Episcopal Schools has reached out to school leaders and heard from a number of them that they will be traveling by bus to either New York or Washington D.C. for marches on March 24, said Jonathan Cooper, the association’s communications manager. 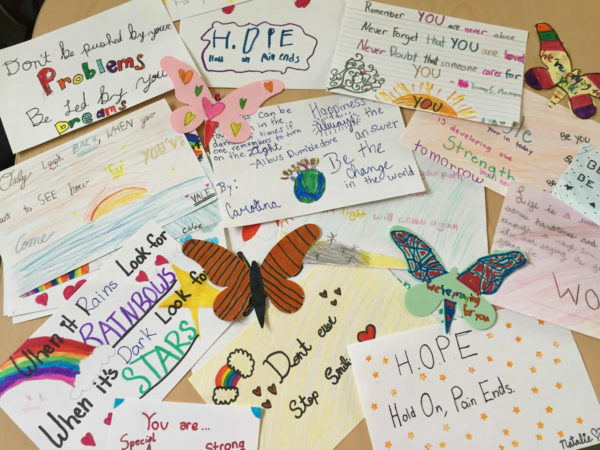 St. Stephen’s Episcopal Day School, a pre-K3 through fifth-grade school in Coconut Grove, Florida, is sending hand-drawn cards to the older students at Marjory Stoneman Douglas High School, he said. Leaders in the Diocese of Washington and at Washington National Cathedral are trying to connect out-of-town Episcopal youth groups, clergy and lay leaders who want to bring students to the March 24 rally with hospitality and lodging with local churches and members. 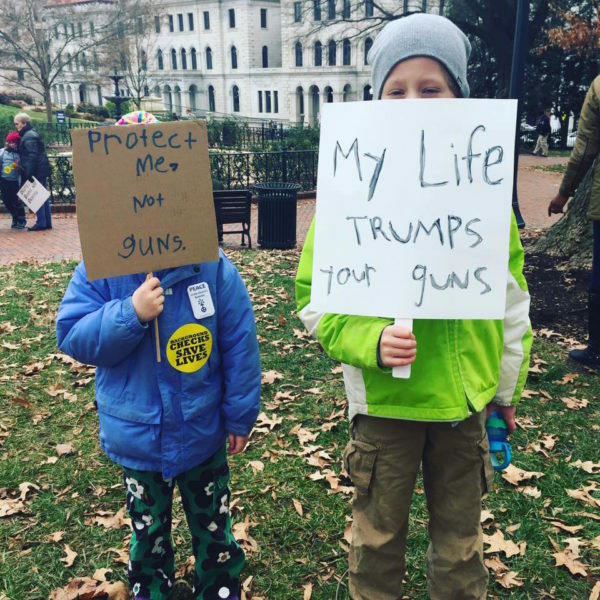 The Lutheran Episcopal Advocacy Ministry of New Jersey is organizing buses to D.C. so that members of the Diocese of Newark, the Diocese of New Jersey and the New Jersey Synod of the Lutheran Church can join the March For Our Lives. The group is encouraging churches to send teens with one chaperone for every five young adults. New Jersey Bishop William “Chip” Stokes invites Episcopalians, young and old, across the church to join in local and national events. “Like so many people across the country, the members of Bishops United Against Gun Violence are enormously grateful to the young people of [Marjory] Stoneman Douglas High School and their peers across the country, who are leading a renewed movement to end gun violence in this country. We are committed to standing in solidarity and anguish with them and supporting their efforts,” Stokes said. On the same day as the planned school walkouts March 14, at least seven dioceses are hosting Day of Lamentation services, also organized by members of Bishops United Against Gun Violence. Trinity Episcopal Cathedral, in Trenton, New Jersey, will be the site of a 12-hour service of prayer and fasting. As head of Episcopal Peace Fellowship, the Rev. Allison Liles has a weekly conference call with about 50 national gun-violence-prevention groups. The fellowship has been working extra hard for this cause the last five years, since Sandy Hook, she said. Liles’ 87-year-old grandmother called her the day after the Parkland shooting from her Alabama home, after seeing a woman with the ash cross on her forehead doubling over in grief. The Feb. 14 shooting was Ash Wednesday, as well as Valentine’s Day. Her grandmother, a lifelong Republican NRA-supporter, wanted Liles to send her sermons and talks about gun violence. Her fellowship’s website offers 10 steps a church can take to reduce gun violence, as well as liturgies on gun violence that clergy and lay leaders can adapt for their own sermons and talks. Before Liles, her husband and their two children moved to Dallas, Texas, in August, they lived in Virginia, where Liles brought her children every year since they were in strollers to an interfaith vigil, rally and lobby day on the Richmond capitol lawn held on Martin Luther King Day. They would pray on the capital lawn and then meet with lawmakers about preventing gun violence. “We believe it’s really important to raise kids who know how to pray with their feet. We want to live out our faith not only at home and church, but in the public sphere,” Liles said. These days, when she or her husband drops off their daughter, Pailet, 6, and son Hill, 9, at school, they emphasize safety in their daily prayers for their children. Liles urges people to overcome their fear of broaching such a controversial issue in church, where many believe politics should be avoided. “But it’s a matter of life and death, so it’s a matter of faith, and it’s up to us to take away the stigma that says gun violence is not something we can talk about in churches,” Liles said. Victoria Hoppes, coordinator of ministries with and for youth in the Diocese of Indianapolis, is helping teens such as Jacobs organize the trip to Washington D.C. Since this movement started, all the diocesan youth ministry coordinators have been in conversation about it, Hoppes said. “I think we are working with a generation that wants to see positive change and is willing to be a voice for positive change. And we don’t always give them a voice and space to take action. This is a youth movement, so we need to make space for them to lead,” Hoppes told ENS. The desire to do something is coming directly from the teenagers and isn’t instigated by adults, she said. The words and actions of Episcopal youth are showing adult Episcopalians how to live out the baptismal covenant in the world, church leaders say. A growing list of Episcopal Church-related resources for confronting gun violence is available here. — Amy Sowder is a special correspondent for the Episcopal News Service and a freelance writer and editor based in Brooklyn. She can be reached at amysowderepiscopalnews@gmail.com. Editor Mary Frances Schjonberg contributed to this report. Sorry, Ms Sowder, but I’m not impressed by all the assorted hoopla. These glorified “student-leaders” are still children. I can of course understand individual grieving for a friend whose life has been snuffed out, and it is reasonable to be unhappy with the apparent inability of the older people in charge to deal with the problem of deranged individuals. But expressing one’s “frustration” by organizing protest marches, designing signs and making use of the news media who will sensationalize anything is not appropriate and will do nothing to “solve” the problem. When I want off to boarding school about 65 years ago I was on occasion terribly homesick. My loving parents were sympathetic but I can well recall my mother strongly recommending that the best thing I could do to deal with the problem would be to concentrate on my schoolwork and to involve myself in all sorts of school activities rather than just feeling sorry for myself. She was absolutely right, her advice worked. The children in the monstrously large school in Florida should receive similar advice. Far better for them to get back to functioning as they should be rather than for parents, school administrators and certain politicians to encourage them to politicize themselves which is exactly what’s happening now. But I realize that’s not fashionable or nearly as much fun. Too bad that so many Episcopalian leaders evidently don’t know any better.. .
Have they had a course on the Constitution yet ? I appreciate the strong leadership skills being demonstrated by these children, and I am grateful to the adults who are working with them. I am filled with new hope by the actions of these young people. In protesting for a better world they are following in the footsteps of the one who overturned the tables in the temple. I’m so proud of these courageous young people for standing up and making their voices be heard. They are the ones who had to live through this horror, and they have every right to say enough is enough. How many school shootings have we already had this year? Should they just have to sit silently by, while yet another disturbed man goes to his local sporting goods store, buys an assault weapon, and murders them in cold blood? They have every right to fight back. And we need to help them. Wasn’t the school in Florida said to be safe? Please, young students, recognize that the problem is NOT an inanimate object, but the failure of adults in charge of schools to properly secure admittance to the school. Lock the doors to the school and channel folks to the principal’s office, which should be locked too. It can be done. Some schools will require extensive work [read that as money] to channel people to a location designed to oversee who is admitted to classrooms. Sounds as if many folks in our EC are merely “jumping on the ban the gun bandwagon” since that is the flavor de jour! The reason that many people want a weapon like the AR 15 is to protect themselves when the U.S. government decides that it wants to take weapons from the citizenry. That folks is dictatorship/tyranny. And, outlaws will always have guns! We have seen the powerful witness of the young #BlackLivesMatter activists in the ongoing struggle to dismantle white supremacy and challenge systemic racism. We have heard the courageous voices of the young Dreamers leading the movement for just immigration reform. And now we are seeing an extraordinary outpouring of passion, energy and activism spearheaded by the students from Marjory Stoneman Douglas High School in Parkland, Florida. In the wake of the tragic shootings that devastated their community they have mobilized, galvanized and organized to defy conventional wisdom that the gun violence in our nation is an intractable, unsolvable problem. ◦They are refusing to become just the latest hashtag in the growing list of mass shootings. ◦They are speaking out when there is nothing nice at all to be said about the scourge of gun violence and the power of the NRA gun lobby. ◦And they are most certainly refusing to be seen and not heard. Do your part to inform and stimulate the public to join your action. Be depressed, discouraged and disappointed at failure and the disheartening effects of ignorance, greed, corruption and bad politics — but never give up. I am immensely proud of these young people who are smart and courageous enough to put their voices out there to those older people who criticize and brush off their candor. I feel it’s disgraceful that anyone would dare question their motives after all they have been through. I also fully support the work being done by these young people and I stand with them. I am astonished that anyone who claims to be a Christian (or a Jew, or a Muslim, etc.) would oppose their actions. 96 Americans every day are killed by guns. To do nothing, again, year after year, after members of Congress have expressed their “thoughts and prayers” 4000 times since 1995, is to show depraved indifference to human life. Seeing your classmates riddled by weapons of wars is hardly the same as being homesick at boarding school. And anyone who has taken a course in the Constitution knows that it can be amended and amendments can be repealed. Each generation has to learn that the government cannot assure their safety, no matter how much they demand it or how much freedom they are willing to give up in the process. After all, mass shootings like these are the predictable result of complete trust in government under the false promise of “gun-free school zones.” They are certainly free of guns, except for the murderers who are unimpressed by the threat of administrative penalties. I am proud of these students for holding adults accountable and I support their efforts. I am moved and encouraged by the courageous leadership of our young people. They will demand and shape an improved future. I’m cheering them on with renewed hope for what’s to come! I stand with these young people. One does not, I think, have to have all the answers in order to confront the challenges around us. I am grateful for their faithfulness, their hopefulness, and their witness. I fervently hope they succeed in changing the world. It could use a good changing. It is a cause for joy that our young people are willing to stand up and be counted against the forces of lethargy, complacency, and just plain wickedness. My mother used to use the phrase, “As ugly as homemade sin.” That describes the gun lobby perfectly. Bravo to the youth who are doing this. Maybe, somehow, they — the future voters — will get the attention of our elected leaders, to take action on guns. No civilian has any need for a semi-automatic gun, for either self-protection or sport. The second amendment authorized people to own muzzle-loaders, not weapons of mass-destruction. I am proud of these young people and how they chose to be brave and voice their opinions. It is hard to fight against authority and empire, but isn’t that’s what Jesus has taught us? Isn’t that’s what He has done? To voice the justice and go against the establishment and authority? As a Christian we were taught to follow His footsteps and it’s about time. Young people: don’t be afraid of the negative voices. They will always be there to scare you and intimidate you. Use this anger and remember them, and use it during the election when it is time for you to vote. Give the power back to people. Let’s do things that adult politicians are too greedy and afraid to accomplish and some adults are too brainwashed to see beyond their own interest. If not now, when? I support these young people and so does my local parish. The vast majority of gun sales will not result in human death, but 100% of abortions do. Sadly, my parish vocally supports the latter and vehemently opposes the former. I can’t get past feeling that the memory of those who were killed and the innocence of those who survived are being abused. As one matures, one learns that often the worst time to do something is when beholden to emotion. An example would be to pause before sending an email (or commenting on a blog) when angry or adversely motivated. It is right to resist the reflexive lust to just do something. These young people moved to action through grief have my support. No age is too young to have a voice speaking for change. If no age is too young to speak FOR change, is no age too young to have a voice AGAINST change? This is crazy talk. On the other hand, I could change my mind if fetuses had a vote on their abortion. There are many good decent law abiding men and women who belong to the NRA. Do progressives think these people are somehow sub human because they belong to this organization? Bruce Babcock said ignoring or being against gun control shows showed a depraved indifference to human life. Funny, I and many others feel exactly the same way about abortion. Progressives always roll their eyes whenever the comparison is made. Let them. Bottom line, it is unbelievably hypocritical to be for gun control and also be for a woman’s so-called right to choose. Susan Russell says the activism of the students reminds her of the “powerful witness” of the Black Lives Matter movement. Really?? The same movement that said through one of it leaders that white people should will their property to a black or brown family if they had no children, in the name of justice and equality? The same movement that hates capitalism, demands reparations to all black people and the elimination of jails, detention centers and prisons? The same “powerful witness” that incites violence against police officers? Yes BLM is a real inspiration Ms Russell. Finally, Mr Babcock said that amendments to the Constitution can be repealed. Gee I wonder which amendment he had in mind? Keep drinking that kool aid my progressive brothers and sisters! Very sensible words, Terry Francis. And especially on this website since many Episcopal clerics have said nice things about Black Lives Matter which is actually a disgusting movement that has led to the deaths of innocent people. Bty a small typo correction. I meant to say “showed a depraved indifference to human life”. That extra word shows next to showed was typed in by mistake. Thank you, thank you, to these articulate, impassioned young people who have greater clarity than do we adults. Let education, common sense and humanity prevail. And let’s hope our elected officials the backbone to stand up to the moneyed, frantic and single-issue NRA.